Kevin – you lost, right? 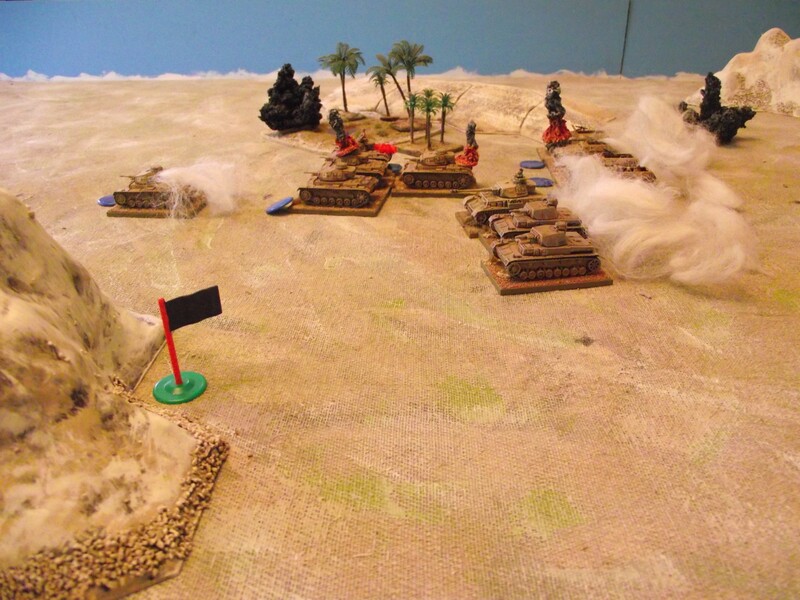 So Kevin was staying up here last weekend and we had decided to do a 750 point Battlegroup Tobruk game. I had previously got some ideas on how to fashion a force and an idea how I wanted to play. 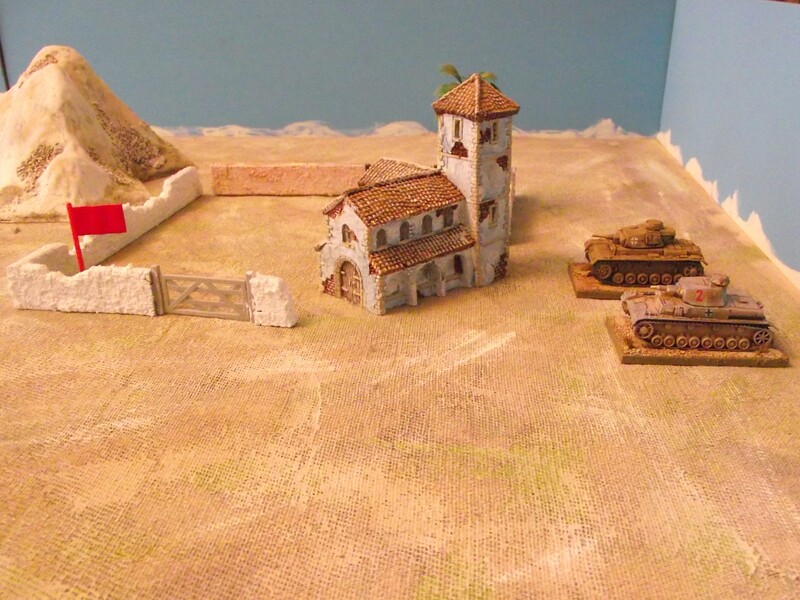 Kevin chose to play the DAK, without Italian help so the scene was set for a great clash. 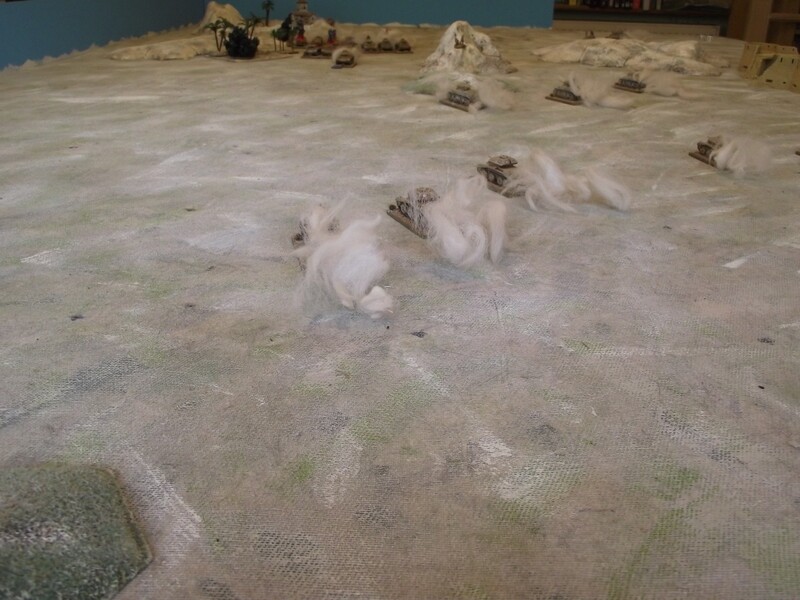 We played the generic attack/counterattack scenario and rolled out the terrain randomly, placing 2 objectives out each. I outscouted Kevin (British stuff is cheaper so I could afford aerial recon) so he started already 1 Battle Counter down. 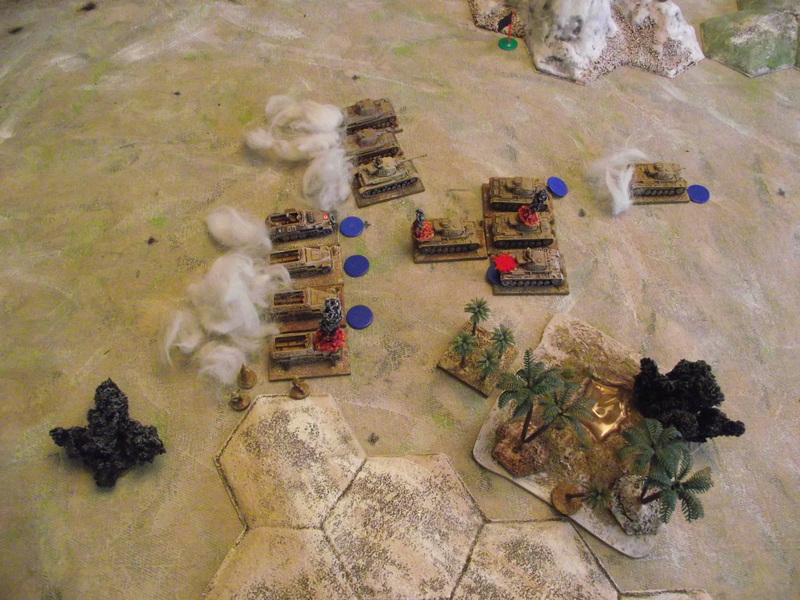 Then Kevin’s timed artillery barrages rained down – on the completely wrong table corner I was using to enter!! Ha!! My table is gridded for ‘square’ games so really registering artillery is pretty simple!! By turn 2 we were all well on, and I forget my opening timed barrages – I had quickly moved them before the start and had thus forgotten them!! Duh!! By turn 3-4 stuff was all going wrong for Kevin. 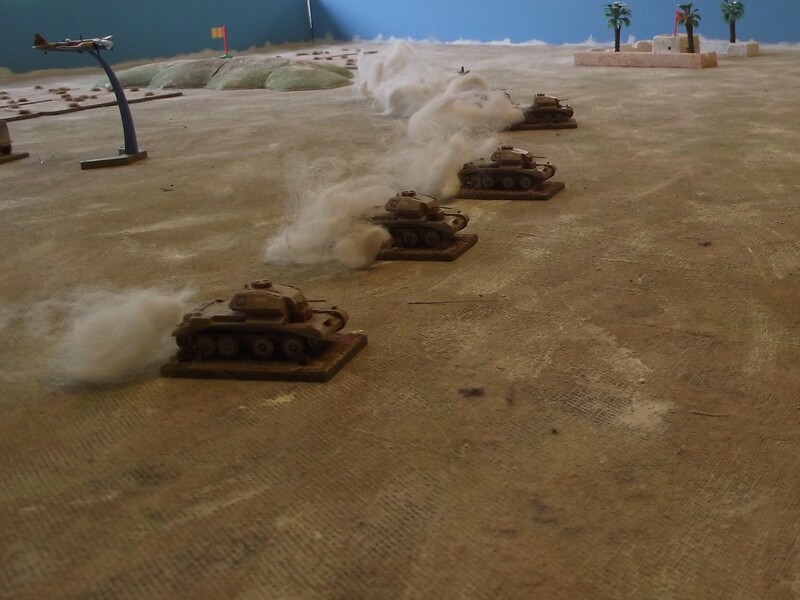 My tank platoons sweeping (in an effective artillery formation) across the desert towards Kevin’s forces – Honeys in the lead, A10’s and A13’s following, with another A13 platoon behind. Look at these baby’s go!!!! Aerial support above and behind. Kevin adopted an interesting formation – the car park. As you can see my timed artillery barrages had fun ranging through his close-knit formations – pining most (blue counter) and destroying (flames) the odd one. Kevin what were you thinking? At this point I actually almost won automatically – most but not all of his units were either pinned or dead – if I had got them all pinned I would have won. We came across a rule omission – what happens to passengers when the armoured vehicle they are in is destroyed. Kevin had put his infantry platoon in Sdkfz 251’s – in the rules soft vehicles take hits before the passengers are harmed – in the rules it seemed the armoured vehicle is destroyed and the passengers with it – surely this was wrong – it meant you were safer in a soft vehicle. Checking the rules forum it appeared this was an omission and the passengers should get 1d3 casualties, with a hard cover save and the remained pinned with a moral check. The only reserves Kevin had – a couple of Pz IVD’s that missed the Armageddon by dint of Kevin not having enough points to bring them on table!! So at that point we found other things to do…………..ha ha Kevin you lost!!! Another really good and quick large Battlegroup game. It showed me the rules can handle a larger, quick moving tank battle. It also showed me how important it is to get a good artillery plan in place – pinning the enemy puts him on the back foot and allows you free movement, I lost no units in this battle. Next I want to try a more attack/defence game. I am liking these rules a lot.